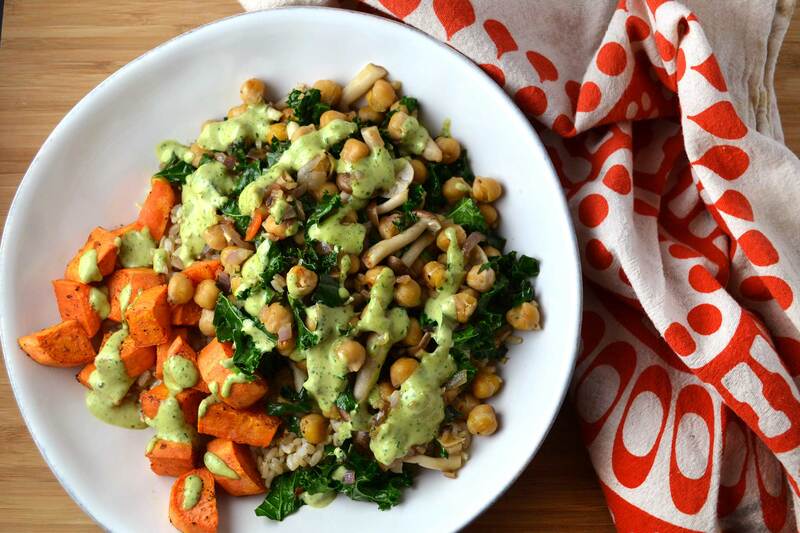 This bowl with sauteed kale, brown beech mushrooms and chickpeas pairs perfectly with roasted sweet potatoes. The herb tahini dressing is addicting! If you bring this for lunch, we recommend bringing the dressing in a separate container so you can heat the rice and veggies first. Preheat the oven to 350 degrees Fahrenheit. Cut the sweet potatoes into 1-inch chunks and spread them out on a baking dish. Drizzle with 1 tablespoon olive oil and season with salt and pepper. Roast for 25 minutes or until fork tender. Remove from the oven. Make the herb tahini: In a blender or food processor combine the tahini, water, garlic clove, cilantro and lemon juice and process until combined. Taste and season with salt. In a large saute pan, heat 1 tablespoon olive oil over medium heat. Cook the onion and brown beech mushrooms until soft, about 3 minutes. Add in the chickpeas and cook until warmed, about 3 minutes. Toss in the kale and stir to combine. Cook until the kale is beginning to soften, 3-5 minutes. Remove from heat. To assemble the bowls, place the rice in a large bowl. Arrange the sweet potatoes on the rice. Add the kale and chickpea mixture. Drizzle with the herb tahini dressing. Dig in!